Well, I fell behind in posting again – weak sauce. But hey, I’m still making dinner! I finally joined a community garden (conveniently located two doors down from my apartment) and have been growing herbs in a shady plot. Most of the herbs have done well so far, except for my golden-variegated sage. Something gnawed on it and the neighboring chervil soon began to overshadow it (pun most definitely intended). I’ve been posting pictures of the garden to instagram (@salabadas). Yesterday it rained and so some of the bushes got knocked around and the larger stems were flattened so I decided to give the poor things a haircut. That’s the great thing about herbs – cut them down to size and they will (hopefully) spring back all the stronger. That’s curly parsley, nasturtiums, thyme and a whole bunch of chervil. I’m also growing garden sorrel (Rumex sanguineus) but it is still small so I didn’t pick any today. After washing – not entirely enough, but hey now I can say I’ve truly tasted Manhattan – I put some oil, a healthy pinch of salt, a bit of pepper and just a splash of red wine vinegar into a bowl and stirred twice, then combined. It tasted chervily (i.e. 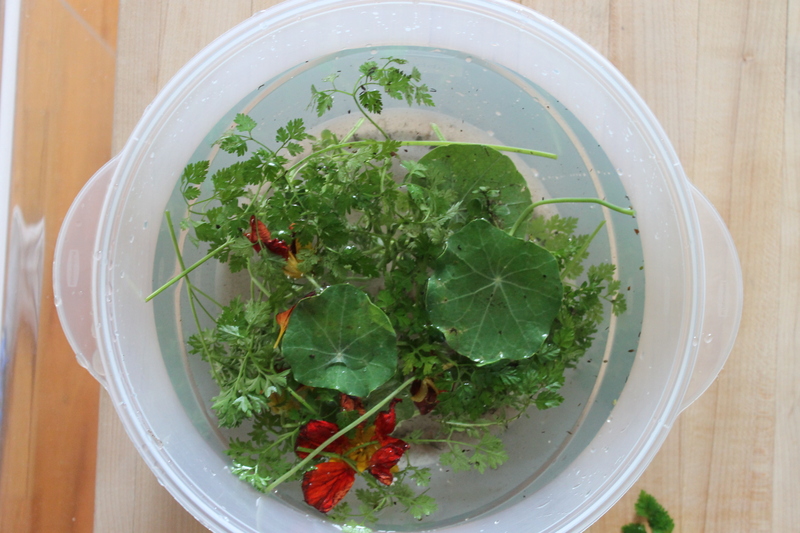 like anise) and peppery from the nasturtiums. And green, like after a summer shower. Not bad for an herb plot forage. 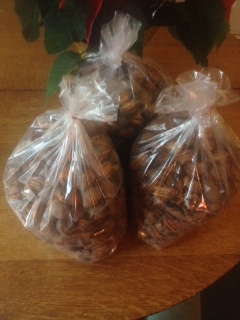 Yesterday I went to the University Barber Shop in Auburn, Al (my home town), which sells pecans from local trees. I bought three bags of cracked pecans. Cracked pecans mean that the shells have been cracked open but not removed. Besides being cheaper, I think they have a nice look in the big plastic bags: mostly striped shells with hints of the flesh showing through. I took them home and spent the late afternoon shelling. There is something so utterly calming about shelling peas or nuts, especially when they’re fresh, watching two bowls slowly fill, one with parts of shells or skins and one with the cleaned produce. I love shelling pecans for the same reason I love cooking: it is a methodical process that engages the senses and the mind without tiring them. Time should be allowed every day, I think, for tasks that offer such satisfaction. And then, when the shelling is done, one can throw the chaff on the fire to make the flames flair and exude a toasty smelling smoke. 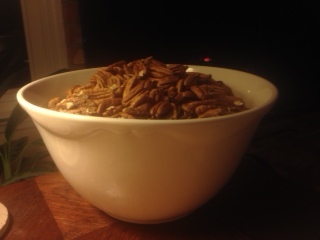 Go through the pecans with a nut scraper or fork to make sure none of the bitter pith is clinging to the flesh. When thoroughly cleaned, spread them on a baking sheet in one layer. Melt the butter in a small dish. 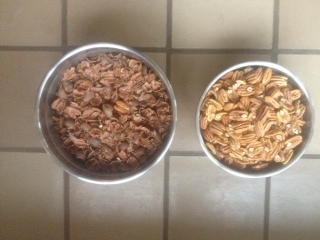 Spoon it over the pecans, give them a good shake, and then spread them out again so that they are not clumped together. Salt liberally and bake in the oven for about an hour, or until the nuts become fragrant and crisp but not blackened. I’m back again on this wet and cold December evening with a recipe I want to share it is still relatively fresh in my mind. I am trying to post more spontaneously and so today I am here with a half-baked recipe, one that isn’t quite worked out yet but that I am going to post anyway because if I don’t now, then when? This was one of those accidentally amazing dishes that I now want to recreate as much as possible. In my apartment we have been eating a lot of basic stuff: rotisserie chicken from the grocery store with steamed kale or broccoli or broccoli rabe or broccolini or cabbage; bolognese (the world’s best) over the same steamed vegetables; sincronizadas with ham and havarti; tuna salad a variety of different ways. To break the monotony, I tried my hand at meatballs with tetrazzini à la Canal House (this is delicious but I still haven’t mastered it and have been avoiding buying sherry, which I think is vital to the recipe, so I may post about that when that happens). A couple of days ago we roasted a pork loin- something we rarely do- having marinated it in olive oil and lots of lemon juice and garlic and salt and pepper. The problem was that the marinade sort of burnt a little in the oven. But wow was it good. Maybe it burnt because I roasted the loin in an aluminum cazuela instead of in a proper baking pan. There is a story behind this: I have been in need of a new cast iron Dutch oven for some time. Now that it is winter and I can turn on the oven in my tiny apartment and not sweat to death, I decided it was time to go out and find one. So I thought that instead of going to a fancy cookware store or a chain, I’d go to one of the kitchen supply places in Chinatown. I mean it’s right down the street! It seemed like a great idea. Perhaps cast iron Dutch ovens are not the most useful thing for Chinese cooking, however, because out of the ten or so places I stopped into, only one store had them. It was way overpriced. So after an entire afternoon of looking, I ended up at K-Mart (sort of the opposite experience that I set out to have but I guess that just goes to show you) and bought an Imusa brand aluminum cazuela for under $20. So far it’s been pretty great. I can make big rice dishes on the stove (the original reason I was looking for a Dutch oven), and I can also bake in it. Anyway, because the surface is not non-stick or seasoned cast iron, the pork juices and accompanying lemony marinade sort of caramelized in a really lovely way. The flavor is slightly bitter (the lemon and the char) but it is also packed with umami goodness. It was fine for a winter’s weeknight. The half-baked recipe follows. To signal that this is still in its experimental stages, I’m going to call it a “draft-stage recipe”. This is something I am going to instate on Sabasalads. I think it will prevent me from waiting to post something that really should just be posted, quick. If I make it again (and I will) and come up with any new tips, I will make a note of it here. Cut 10-12 slits in the pork loin on both bottom and top. Peel 10-12 cloves of garlic and stick one in each of the incisions. Put the pork in a dutch oven or cazuela and slather with good olive oil and lots of lemon juice. Try not to let lemon seeds fall in but don’t worry too much about it. Remove thyme leaves from the stem and scatter about. If you have any garlic cloves left over, scatter them around the pan as well. Now rub the marinade over the pork, making sure that it is covered. Massage some of it into the slits with garlic as well. Wash hands and pre-heat the oven to 450. While the oven is getting hot, let the pork sit for about 30 minutes. Give the pork in the cazuela or dutch oven a final glug of olive oil for good measure and roast for 45 minutes. When the pork is done, remove the pot from the oven and take the pork loin out to cool. In the pan, you should have a thin film of blackened lemon juice, oil and pork fat. While the meat is cooling, add a bit of balsamic vinegar or maybe a bit of white wine to the pot and heat it over a gentle flame, deglazing the pan to make a sauce. The sauce will have little bits of charred garlic and thyme and that is fine. You will love it. Hello from Brussels sprouts season. Please excuse the blurry picture – it’s been a while. Wow. It’s been a whole eight months since my last post. Here’s what I think happened: after I moved back to the US from Berlin, I spent a lot less time alone. This was great, but I inevitably dedicated less time to thinking up recipes to share here. It used to be part of my weekly routine, and then it became bi-weekly, then monthly. There was also something else nagging me though. The writing felt fake. I don’t know exactly how to explain this but all I can say is that the “voice” I assumed when writing blog posts just didn’t seem to be true. About this time last year, I was looking for a new direction, something to make the writing “stand out.” I even thought of changing the blog’s name and coming up with a new theme. Somewhere along the way it stopped being fun and felt like a chore. And the writing and recipes weren’t getting any more interesting. There’s also the fact that living in NYC has changed the way I cook. I don’t go to farmers’ markets as often because I finally joined a CSA (great vegetables weekly but less rustic/charming market photo opportunities!). I also don’t have any kitchen space whatsoever and never invite people over for dinner. (Oh yeah, I moved to Manhattan in June and now share a 400 sq. foot studio with my partner. We don’t have a dining room table or any chairs – we use tatami mats – and barely own any kitchen utensils). It’s all great actually. I love it. But it means that cooking has been increasingly simplified and somewhat boring as a result (good, but boring). Maybe all of these things created the perfect storm for an eight-month hiatus on Sabasalads. I hope I can now break out of that. Now that I’m typing away I realize how much I missed this, and that instead of treating it like a job I should treat it like what it really is: a place to muse about whatever. A place where the stakes are low. This is a good thing! Also, I find it amazing that over the course of all these years (before and during Sabasalads), the one constant thing that always makes me happy is thinking and talking about food and drink. It doesn’t pay the bills, and it is a simple pleasure, but it always has been and always will be a pleasure. I have to listen to that. Some people relax by exercising or reading or taking a walk. I like to read. I like to exercise. I especially like to take walks, but tend to use walking time as “thinking time” (I talk to myself when I walk – I scheme to myself). For me though the thing that puts my mind to rest is cooking a meal. Cooking or listening to radio programs about cooking or watching cooking shows or reading about food or following Wikipedia threads about the origins of a dish are some of the only activities during which I am not thinking about the pressures of the “real world.” I can’t think about these other things because I get so absorbed and feel so satisfied that there is no room for the other stuff. And I’m proud to say that I almost always make time for one of these things on a daily basis, other “real-world” tasks be damned. Now it’s time to start writing about food and drink again, but this time, I hope, with less affectation. The next few months are going to be tough. I am nearing the final phase of writing up my dissertation. I’m on the job market. I am not sure what is next in my life, but I have some ideas and they will require some work. But I do not ever want to leave this space fallow for so long again. Notes: The recipe calls for sherry vinegar. I substituted balsamic vinegar and it worked fine- you want to just add a splash of balsamic though or it will be too acidic. The original recipe also calls for fleur de sel as a garnish. I did not have this either and just added extra salt to taste at the end. In a sturdy skillet, brown the butter (you want the butter to cook a bit and develop flavor – let it foam up and wait until the foam subsides). When butter is browned add the Brussels sprouts and spread them out so that they all get some surface area. Reduce heat to medium and cook these for 3-4 minutes, until they are well browned on one side. Then season with salt to taste, toss and cook for another 3-4 minutes. While the sprouts are cooking, poach an egg in boiling water and reserve for garnish. When the sprouts are done cooking, deglaze the pan with a splash of vinegar. 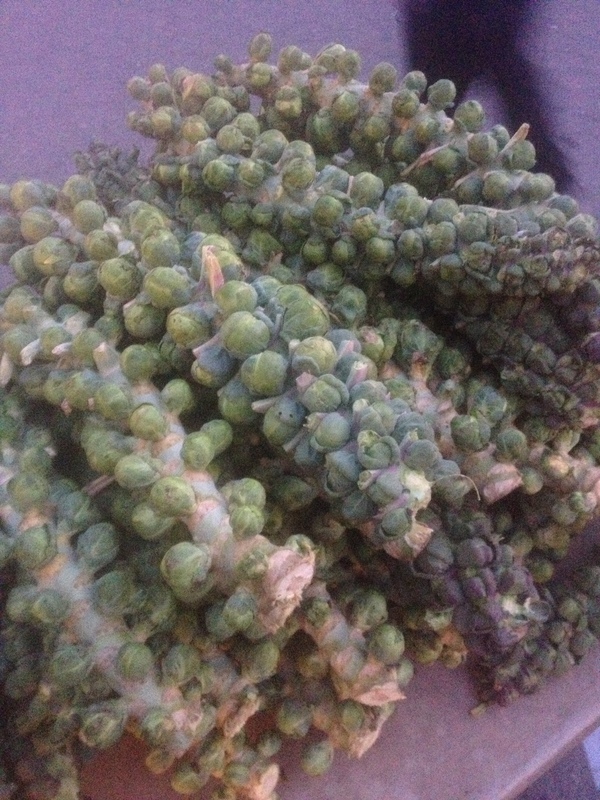 At this point, season with salt to taste and let the sprouts cook for a minute more. Serve the Brussels sprouts immediately. Finely chop or crumble the chicharrones and sprinkle liberally over the sprouts and top with a poached egg. My current apartment came furnished, so I didn’t bring many things with me. Other than clothes and a computer, there was one box of kitchen utensils, in case. Recently, my lessee gave part of her household things to to her parents, who were furnishing an apartment in Manhattan. One item on their wish list was any kitchen supplies that might not be in use. Other than the box of kitchen things I had brought from Chicago, we hung on to two coffee mugs, two forks, two spoons, two plates, two serving bowls, an electric kettle, a cutting board and a one-cup coffee filter holder. The inventory of this apartment’s kitchen can now be laid out in a rectangular space measuring approximately 3 x 4 feet. Looking at the picture, I think that there is even more that I wouldn’t miss. The large baking sheet, for example, that doesn’t even fit in our very small oven, the coffee grinder, and maybe even the glass measuring cup. This is handy, but since I don’t bake I rarely need precise liquid measures. I could probably also do without the frying pan, since the tops of the two green saucepans double as frying pans. The most complex thing in the group is the Cuisinart Pro Custom 11 food processor, left to me by a friend who moved to Beirut after college. This is my crutch: I just don’t think I could do without it. Perhaps one day I will learn how to grind chickpeas into a purée by hand, but I don’t see it happening soon. 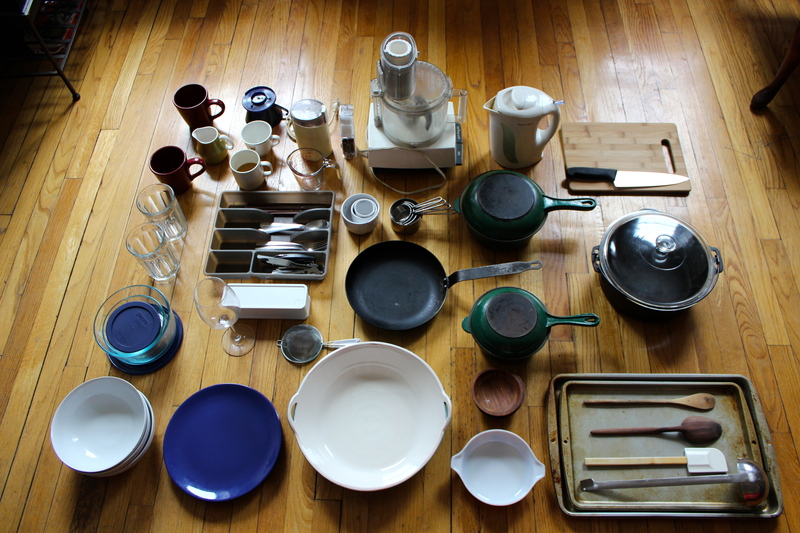 Before the cull, our inventory was still spare but it included a few gadgets. To my surprise, I do not miss the lemon-juicer (the small metal sieves pictured above work great), the strainers or the salad spinner (again, small metal sieves, or just shaking things out by hand), or the non-stick pans (up the oil and butter, lower the heat). I find that I do miss the hand-held cheese grater and will probably buy another. If you cook regularly without meat, parmesan cheese is an absolute treasure for its umami, and chopping it up by hand just doesn’t cut it. I may try grating it in the Cuisinart though. It has no grating appendage but that thing works wonders. It isn’t my place to lecture about how much one should have – to each his own – but this accidental chain of events leading to a reduced stock of stuff has been a relief. It takes getting used to for a few days and, yes, what we cook here has had to become simpler. Dinner parties are out of the question (no table, no chairs, not enough cutlery or dinner service). The space is cleaner, though, since it is critical to wash dishes at every stage of cooking. Most importantly, the quality of the food hasn’t suffered. I would argue that the cooking around here has been smarter than ever. I’ve posted these directions in several forms in the history of this blog but I’m going to do it in detail here. As many grandmothers would probably tell you, one can cook perfect, fluffy rice successfully with only a saucepan, a bowl and a paper towel. Heat some water in your saucepan. When the water is hot but not yet boiling, put the cup of rice in a bowl and cover it with the warm water. Let this sit for 15 minutes or so. Next, pour the water and rice back into the saucepan. Fill with cold water and, using the saucepan lid as a strainer by holding it against the rim of the saucepan, slowly pour out the cold water into the sink, taking care that no rice spills out. Continue this until the water runs clear. When the rice has been washed, remove it back to the bowl. Dry out your pot and then heat your fat of choice. If you’re cooking east asian, use peanut or sesame oil. If you’re cooking mediterranean or latin american, use olive oil. If you’re cooking middle eastern or south asian, use butter with a bit of olive oil to prevent it from burning. When the fat is hot, add the rice and stir to coat. Let the rice fry, stirring so it doesn’t stick, until it begins to brown, having changed from cloudy-white to slightly translucent. Then, add 1.5 to 1.75 cups of water (I err on the side of less water). Give the rice a final stir. Bring this to a boil and let boil until the rice has absorbed enough water so that you can see the top of it, where holes letting steam escape should be forming. Then, turn the heat to med-low and place a paper towel or clean dish rag over the top of the pot, and firmly close the lid (you’re trying to create a situation where little steam escapes. Let this continue cooking, covered, over med-low heat for 5 minutes. 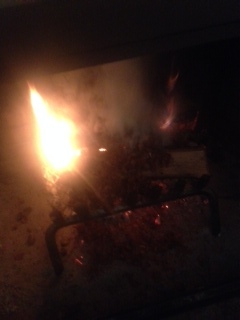 Turn the heat off and let the pot sit, covered, for 20 minutes. Do not open. Do not stir. It should be perfectly cooked after 20 minutes. For the last month, cabbage has been a staple at the dinner table. 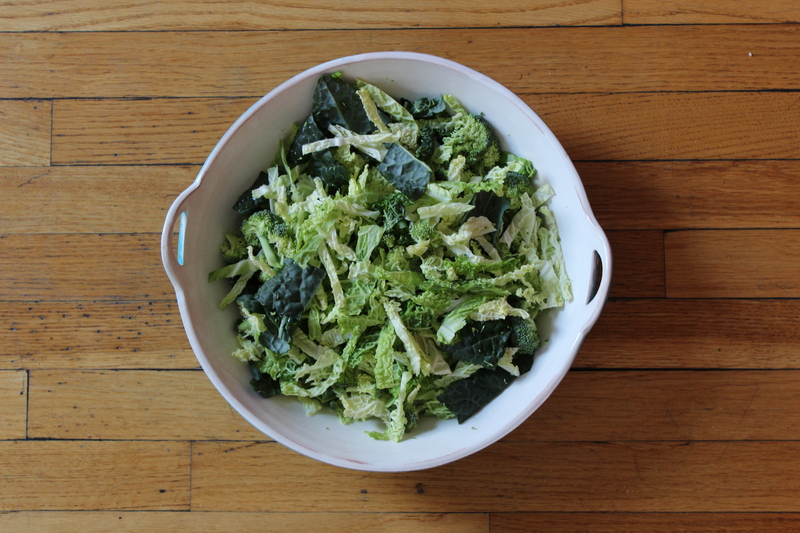 The simplicity and crispness of raw cabbage salads in January might be the perfect antidote to the rich dinners of December. 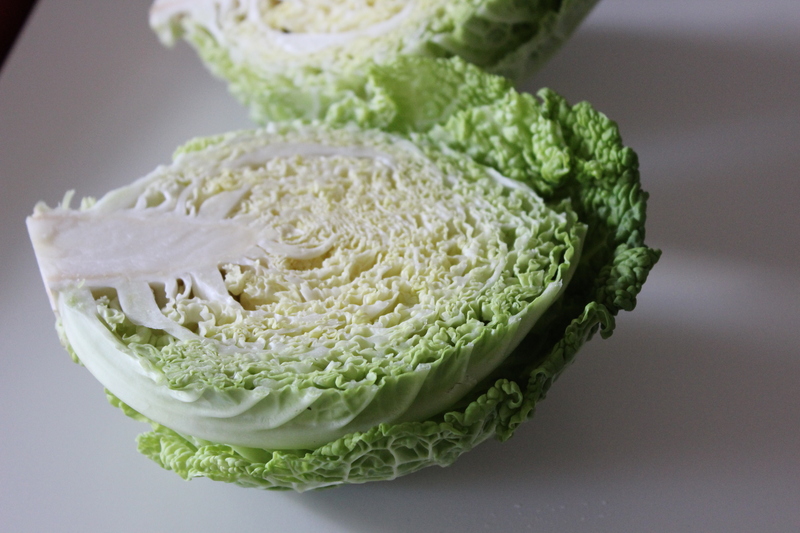 Also, when the weather gets very cold, cabbage takes on a sweetness that it lacks at other times of year. Raw cabbage goes very well with other members of the brassica family: broccoli, dark green tuscan kale, curly kale, and sweet, raw brussels sprouts. Because this is a one dish meal and involves no cooking, I like to take my time and shred everything to exactly the right consistency when I make raw salads from cabbage. 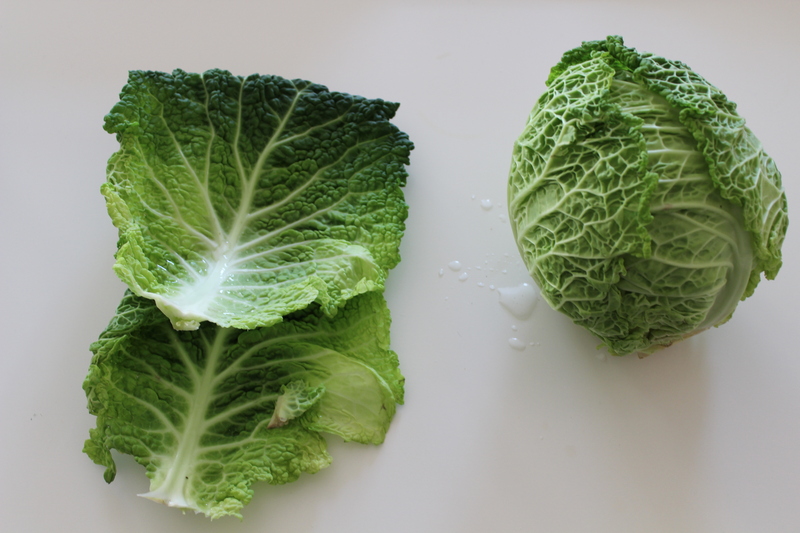 First, I remove the greenest outer leaves from the cabbage and wash them well. I cut out their cores and save them – as I have recently learned, one should always save cabbage, kale and broccoli cores for making pasta sauce. This is the second part of cabbage “two ways” and I will go into it below. Next, I roll up these cabbage leaves like a cigar and chop them finely to get long strands. I throw them into a large bowl and then cut the tightly-bound cabbage center in half, remove the core and shred the same way. Then I move onto the kale. Kale eaten raw must be treated differently than cooked kale: you don’t want to eat the bitter raw stems so it’s best to remove them and, again, save for use later. For these salads, I use [tuscan kale], also called lacinato kale or cavolo nero, since the texture of its leaves is flatter than the curly varieties. After washing, I simply tear the green leafy part away from the stem and chop it into bite-sized pieces. At this point, I make the dressing. Several versions on an olive oil and lemon juice mixture work well here. 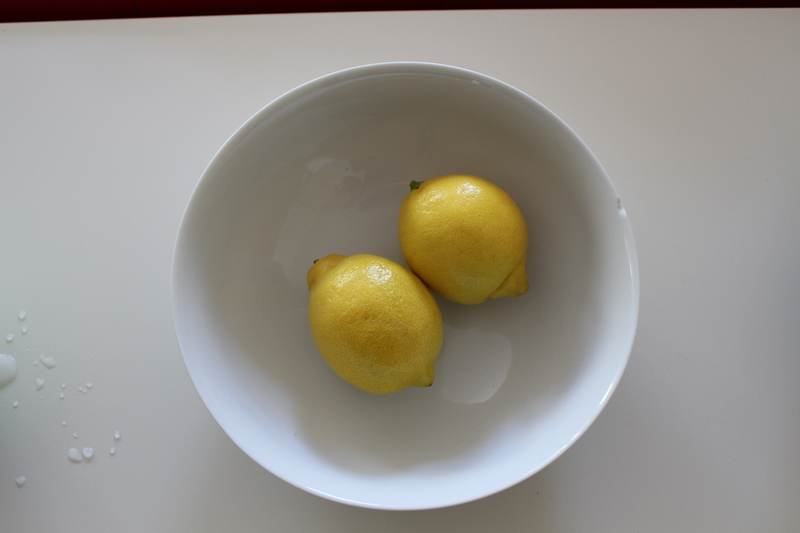 The simplest is a mix of 3 parts good olive oil to 1 part lemon juice and 1 part soy sauce. This works well on its own or with 1 avocado, diced and mixed into the salad at the same time you add the dressing. Crisped bacon is also delicious as an add-on. If you don’t have avocado or bacon, try toasting a spoon of sesame seeds and throwing them into the mix. Another of my favorites is 3 to 1 oil and lemon juice plus grated parmesan cheese to finish. Parmesan and cabbage are a heavenly combination. Or, just oil and lemon (3 to 1) and a good pinch of salt work fine too. Once the dressing is made, I wash my hands, and add the dressing to the chopped kale and cabbage, and massage it into the leaves with my fingers. Ten minutes in oil and lemon juice will soften their hard edges and bitter bite. While the leaves are “marinating,” I chop up any remaining ingredients (broccoli, brussels sprouts etc.). 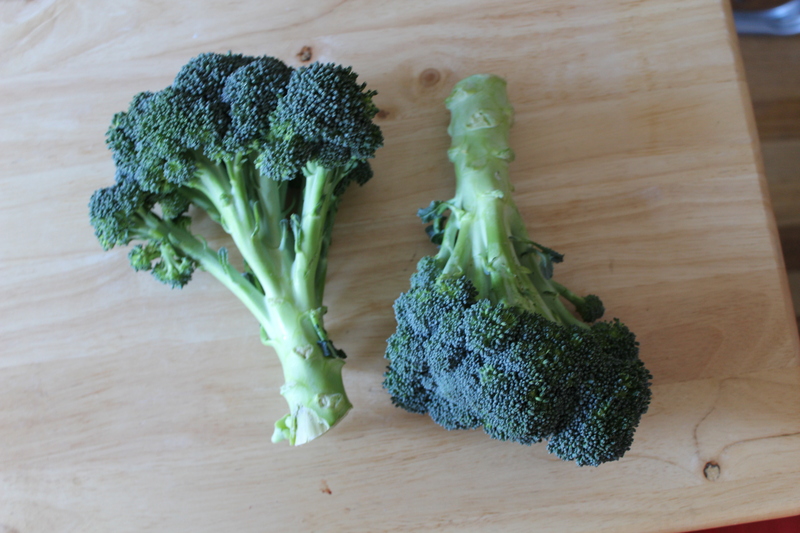 I like to thinly slice the broccoli on the bias, so that you get longish but thin stalks that roughly match the size and shape of the cabbage threads. Brussels sprouts should be shredded finely too. When this is done, I put it all together and give it one more toss with my hands. I usually add a ton of black pepper, which never hurt anything. Shred, chop and dice the vegetables as discussed above, doing the kale and cabbage first, mixing your dressing and avocado if you use it and letting those things marinate for a while. Then add in broccoli, sprouts and whatever else you’re using, toss and serve in large bowls. Chopsticks are the best utensil for eating this salad, which is fine alone and even better accompanied by a plain omelette, cut into thin slices and dipped into the extra dressing that falls to the bottom of the serving bowl. Having saved all of your cores, you will quickly accumulate enough through the week to make Tamar Adler’s core, stem and leaf “pesto” that is so good with pasta or rice you might start buying cabbage just to cut out the cores and make this dish. Other than the cores, you’ll need decent olive oil and a good parmesan-style cheese – a must for the dish. One note about this otherwise delicious and amazingly thrifty dish: I find that while cabbage, broccoli and cauliflower create a nicely textured sauce, using the stems of swiss chard, bok choi, kale and other very fibrous plants can result in a more stringy texture. This may not bother you, but I personally prefer to weight my mix of stems and cores it on the side of cabbage and broccoli parts, going lighter on the kale/chard/collard stems. Put your pieces of cores and stems into a smallish pot and add water to cover only half. Salt the water well. Add the 1/2 cup of olive oil and three garlic cloves and bring this mixture to a simmer. Taste the water at this point and make sure it’s flavorful and salty. Simmer everything uncovered for about 20 minutes. If you lose water during this process, it’s fine. You don’t want to add water unless it all boils off and the pieces start to burn. When pieces are smashed easily with a wooden spoon, they’re ready. Take the pot off the heat and add the solids and about a cup of the liquid to a food processor. Pulse a few times, adding the cooking liquid as you go to thin if necessary. This is actually better if there are some chunks left in it so you don’t need to blend until smooth. I like to add grated parmesan cheese while it’s blending, and then put it back on the stove and add more, and maybe a bit of liquid. This is delicious with hot pasta, mixed with a little of the pasta water to make a sauce, or served on its own aside meat or fish as you would mashed potatoes. This Christmas Eve the Sabas are in New York seeing the sights before what I hope will be a very relaxed holiday. Today we’re eating out: it’s Balthazar for lunch and then the Oyster Bar in Grand Central Station for an evening snack. I don’t think we’ll need much more than that after lunch. The duck comes via a recipe featured in Canal House Cooking, Volume 2, and in another version on saveur.com. It involves cooking the duck in a casserole with rice and white beans and root vegetables. I love rice-based meat and veg dishes like this. The Panettone comes via the grocery store. I still have an unreasonable fear of baking. Of course, these stories are not merely about food, but those ingredients and dishes that only come on special occasions serve as anchors for the deeper, more transcendent ideas.